In my day, I’ve researched and authored more than a few analyst reports on the billing market, but I never looked at the Interconnect and Settlements area in any depth because it was a relatively small market and so specialized and complex. So this is why I was delighted to get a call from Subex asking me to conduct an independent survey and report on the changes coming to telecom wholesale systems as a result of advanced services. Fast execution — that’s going to be vital in this new world as time-to-market, profit assurance, and managing credit risks all rise in importance. Now the typical wholesaler-to-partner relationship of the past has been quite formal and business-like — often adversarial. The reason? The wholesaler was largely in control of the relationship because the partner’s choice of wholesale suppliers was rather limited. The Commoditization of Voice -- Thee impact of Skype, VoIP Providers, and mobile competition is turning voice into a low margin, high volume service. Real-Time, Policy Driven Call Routing -- Advances in least cost and optimal routing techniques allow a partner to implement a very granular routing plan and efficiently manage dozens of wholesalers, not just a few. Efficient Trading Systems -- Partners also have highly automated trading systems today which enable them to collect and organize new tariff schedules from wholesalers with the click of a mouse. Network Federation to Partners -- Telecoms used to be a business of great vertical integration. Today, the only prudent way to offer a “full-service” capability is to lease the facilities, content, or services of other providers. So the wisest players know when to own and when to partner. 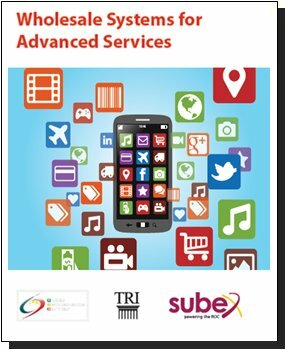 So these are some the issues explored in this survey report entitled, Wholesale Systems for Advanced Services, which you can download from the Subex website for free. The report is 19 pages long, but I think you’ll find it an easy read — there are many charts and figures to scan. I would like to thank Subex and the Global Settlements Carrier Group (GSC) and its members for contributing their expertise and thinking to this research. Hope you find the report interesting and profitable reading. Special Report: Wholesale Systems for Advanced Services — by Dan Baker — Plenty of technology and market changes are disrupting the telecom wholesale market: advanced services, new kinds of partners,,and the need to monitor relationships and services more closely than was ever required in the circuit voice world. This article introduces a TRI special report discussing the kind of Wholesale Systems needed in this challenging marketplace. Data Integrity Issues Go Global in the Telecom Wholesale Exchange — interview with Vic Bozzo — Wholesale systems enable operators to expand their global reach and work efficiently with partners in an increasingly interdependent telco business. In this article, you’ll learn about: how many subsystems work together in support of the global trading exchange, why data integrity has become critical, and how wholesale business trends are affecting wholesale systems at Tier 1 and mobile operators. Carrier Usage Audits: Why Regular Checkups Are the Key to a CSP’s Bottom-Line Health — by Brian Silvestri — Many telecoms are wholly unaware of the risks of not having a solid usage auditing program for interconnect bills. Rather than a once-a-year or once-a-quarter audit, this article makes the case for regular monthly audits. Also discussed are: the different types of audits and organizations involved; the dangers of not auditing often; and factors to consider when selecting a cost-management vendor. Invoice Audit Productivity: From 19th Century Textile Mill to SaaS — by Peter Yelle — When it comes to invoice reconciliation, are your processes and tools modern and efficient, or is your company stuck in a 19th century time warp? This article show how operators can vastly reduce their manual audit steps by automating via a SaaS solution. The detailed case study and diagram show which tasks were automated to achieve an 80%+ productivity gain. Cost Assurance: Dealing with Rating Variety in Wholesale Bills — by David West — Validation of intercarrier wholesale invoices seems like a fairly straight forward process. But regulatory rules and a variety of bill rating methods have made it very complex. This article details the challenge by walking through a wireless carrier case, then laying out the argument why operators should opt for a custom solution based on a core reporting engine. Network Asset Choreography: Subex Teaches Analytics to Dance with Discovery & Life Cycle Management — interview with John Brooks — Network provisioning and asset life cycle management is a foreign world to most business assurance professionals because it’s a domain that lives outside the order-to-cash stream. This article explains how new analytics and network discovery techniques are enabling operators to better track assets, plan capacity, and pave the way for strategic network deployments and decommissioning. Atlanta-lytics: New Telecom Conference Features Revenue and Customer Analytics — by Dan Baker — A new telecom conference on analytics in Atlanta (January 29 — 31) is shaping up to be a key event for people who want to stay abreast of this fast moving field. Black Swan is hosting a half-day, pre-conference workshop entitled, “Financial and Revenue Analytics” featuring seven speakers, many of whom are contributors to this magazine. Detailed program guide is enclosed. Big Data Financial Analytics: Creating Business Value for Tier 1 Telecoms — interview with John Devolites & Atul Jain — What exactly is an analytics company? This interview with executives at TEOCO helps defines this new breed of telecom solution vendor — a cross between software, consulting, and assurance supplier. Along with a few Tier 1 case studies, the interview discusses: big-data vs. sampling, analytics project management, and the importance of data access. Margin Analysis: Bolting Profit Assurance onto a Revenue Assurance Platform — by Efrat Nissimov — Margin analysis is one of the hottest trends in business assurance. But what’s all the excitement about? This article explains the benefits, the market forces driving its adoption, and its advantages over Excel and heritage data warehouse approaches in terms of flexibility, data granularity and quicker time to access. The author also touts major cost savings if margin analysis is deployed as a module within an existing revenue assurance suite. Partner Settlement: The Adaptable Chameleon that Lives Between Wholesale and Retail Billing — interview with Arun Kalavath — Partner settlement has been around a long time, but its profile is on the rise because wholesalers are offering new services and content services are bringing settlements into the retail sector. In this article, you’ll learn about the market forces changing the wholesale business, the expanded portfolio of services that require settlement, and advice on how to pick a settlements solution vendor. Will Apple Take a Bite Out of Carrier SMS Revenues? Likely. — by Brian Silvestri — Text messaging generates $20 billion of revenue each year for U.S. carriers alone. But Apple’s lastest iPhones come with iMessage, a free embedded messaging service. But while the long term threat to SMS revenue is clear, what strategies should operators be following today? This article discusses the many factors operators need to consider, offering advice on how mobile operators can keep SMS profits rolling in as long as possible. Least Cost Routing and Rate Audits Not Delivering the Savings You Expected? Here’s Maybe Why — by Brian Silvestri — Least cost routing (LCR) is supposed to be one of telecom’s greatest cost-saving innovations. Yet Connectiv Solution’s research suggests that the LCR programs at many U.S. carriers are losing millions of dollars. The story explains the traffic analytics steps service providers must take to ensure profitable LCR and other cost assurance programs. Wireless Backhaul: Preparing for the Cleanup When the Dust Settles — by Charlie Thomas — Wireless backhaul represents perhaps the largest telecom build-out in the last decade. This article lays out a strategy for operators as they sooner or later must groom, optimize and re-engineer their backhaul networks based on actual capacity needs, new pricing and improved supplier agreements. The article lays out a 6-point plan for ensuring success. Is Offering Free International LD on Your Horizon? Follow These Checkpoints — by Hulya Altinsoy — Free is a magic word for consumers. So how about adding free international long distance (LD) to your list of services? While free international LD serivce is fraught with risk, the article presents a 5-point checklist to help get your bearings before you make the leap. The article also presents an analysis of billions of minutes in international LD calls by U.S. wireless carriers. Real-Time Network Intelligence: The New Way to Read Telecom Tea Leaves — by Suren Nathan — Real-time network intelligence is the key to deciding which products to launch, whose facilities to lease, and where to route traffic. The article explains why telecoms — and especially enhanced service providers -- should ideally be equipped with both a fine-grained margin analysis solution and a SaaS platform, offering an upgrade path that requires no internat IT support. International Call Routing: A Challenging Area to Master, But Payoffs Can Be Big — interview with John Fitzpatrick — International call routing offers a completely different set of challenges than the common practices found in North America. This article explains the many issues faced in international LCR from imprecise routing and number portability headaches � to dispute problems and the flood of wholesaler rate sheets that must be rapidly made sense of and implemented in the routing plan. Dynamic Call Routing: The Market Enabler that Allows VoIP to Improve with Age — interview with Neal Axelrad — Least cost routing (LCR) has matured greatly in recent years. Today’s routing is far more dynamic because of new real-time capabilities. This article explains technology advances that instaneously re-routie calls based on real-time intellgence gathering from the network. Also discussed are template-driven rate addendums, SaaS delivery, and the economics of LCR. Network Inventory Integrity: Taking Cost Management to a Higher Level — interview with Suren Nathan — Recovering stranded assets and capacity is essential for minimizing CAPEX and leasing costs. This article makes the case for reconciling network inventory through the many ordering, billing, and other systems that interact with that inventory. Meet Your New Cost Management Solution: A Tandem Hub Carrier — interview with Surendra Saboo — In the telco interconnect game, frustrations are many: high tolls, jurisdiction scams, and the expense of connecting to a partner. This article explains how tandem or aggregation carriers are making life easier and saving operators a boatload of money. Learn the difference between peering and a “tandem hub” and why this trend is becoming increasingly global.